Torture in America: The New Electric Chair! Non-Lethal Says Who ? Another Taser Execution! (CBS/AP) A man died after state troopers stunned him with a Taser when they said he became “uncooperative” after being involved in a wreck.The man, identified by his father as Mark C. Backlund, was involved in a rush-hour crash Tuesday evening on Interstate 694 in New Brighton. No other vehicles were involved.”Troopers attempted to bring the situation and individual under control, and in the process, deployed a taser,” said Lt. Mark Peterson with the Minnesota State Patrol.Backlund was breathing but unconscious when paramedics arrived, according to Allina Medical Transportation spokesman Tim Burke. He was pronounced dead at Unity Hospital in Fridley.The official cause of Backlund’s death has not been determined, the state Department of Public Safety said. The Anoka County Medical Examiner was performing an autopsy. Backlund had been driving to the airport to pick up his parents, who were returning from a trip to Florida. State Patrol Lt. Mark Peterson didn’t return telephone calls Wednesday or Thursday from The Associated Press seeking more information. CBS station WCCO correspondent Sue Turner said his parents were picking up their luggage when they got a call from one of Mark’s friends informing them that their son was dead. Gordon Backlund said he was told his son’s heart stopped, but he added his son had no heart conditions. Autopsy results are not expected until Thursday afternoon at the earliest. The life they describe is not one of a man out of control. Mark lived with his parents after moving back home from California. He was working part-time while attending school. His family said he was always there to help a friend in need. 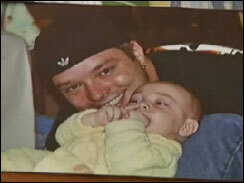 He leaves behind a 2-year-old child, Nathaniel. A U.S. Justice Department study released in October said arrest-related deaths involving Tasers or other conducted-energy devices are rising, although overall numbers are low. From 2003-2005, there were 36 such deaths total, with a jump from 3 cases in 2003 to 24 in 2005. “It’s sometimes upsetting to look at, but really the alternative is a big wrestling match with a police officer and could escalate all the way up to a use of deadly force,” said Minneapolis Deputy Chief Scott Gerlicher in October 2007. He spoke about Tasers then because the Minneapolis Police Department is equipping some of its tasers with cameras. His department had done an internal study on Taser use and found it reduced injuries to the officers completely. Injuries to the people tasered was 5.8 percent, compared to 43 percent when officers used traditional force. In 2006, MPD officers used Tasers 232 times, up 75 percent from the year before. Proof Again that Non-Lethal Weapons are quite Lethal.. I think it would have be more merciful to have shot the guy….At least with an arm wound he could have lived.. I also thought the Electric Chair was banned in some states ??? This Tasering is just like the “Electric Chair” but with no judge or jury to convict you! and NOBODY will bat an eyelash. Anytime a person is given an electrical shock of this magnitude, there is a risk of death! 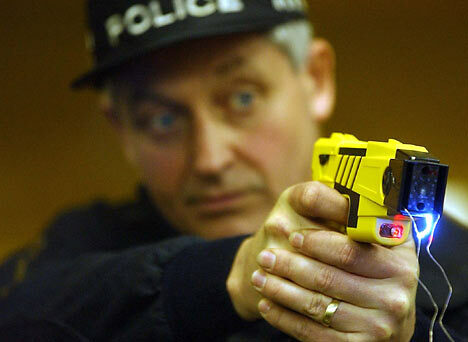 There should have been more in depth testing of the tasers BEFORE they were put in the hands of trigger happy people.